Illustration: The Hermit from Anitichi Tarrochi Lombardi [Ancient Tarots of Lombardy] by Ferdinando Gumppenberg (c. 1810) (copyright &COPY; 1995 Lo Scarabeo). Click the image for a larger one. Many things (true, false, and speculative) have been written about the history of the tarot. This sheet addresses some oft-repeated statements about the tarot that may seem like historical fact, but are actually without basis in the evidence presently available. This is not to say that there is no room for speculative or non-factual stories about the tarot. Myths and lore express the human soul and creativity. These myths tell us much about the significance tarot has on an inspirational growth level. They speak an inner truth that is, at times, more personally true than external facts. However, both history and myth may suffer when the two become confused. Illustration (above): The Papess from Tarot de Marseille by Nicolas Conver (1761), re-published by Héron. Click on the image for a larger one. The information given here consists mostly of conclusions that recent tarot historians have drawn from studying the evidence of written documents and cards that have come down to us. Other interpretations might be drawn from the same body of evidence. Readers interested in examining the evidence for themselves and drawing their own conclusions are directed to the references listed at the end of this sheet for useful starting places. Readers should also be aware of the limitations of relying on documentary evidence alone. Although written records are our most reliable contact with centuries past, they do not preserve everything that people thought or did, especially pertaining to an aspect of popular culture, such as the tarot. The information on this sheet may be freely used, although direct quotations must be credited and an acknowledgement would be appreciated if you found this sheet especially useful. Permission is granted to photocopy for educational, nonprofit uses. Inaccurate: The tarot comes from Egypt; India; China; Fez, Morocco; the Sufis; the Cathars; Jewish Kabbalists or Moses; or the origin of the tarot is unknown. Current Historical Understanding: The tarot originated in northern Italy early in the 15th century (1420-1440). There is no evidence for it originating in any other time or place. The earliest extant cards are lavish hand-painted decks from the courts of the nobility [see illustration, above]. 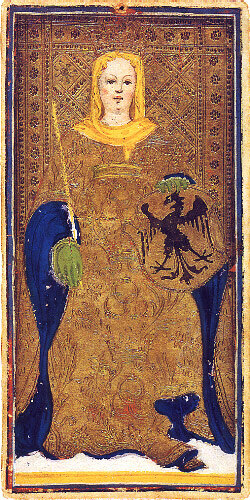 Illustration (above): The Empress (attributed to Bonifacio Bembo) from the Pierpont Morgan-Bergamo Visconti-Sforza Tarot (mid-15th century) (from The Visconti-Sforza Tarot Cards by Michael Dummett, copyright &COPY; 1986 George Braziller). Click the image for a larger one. Inaccurate: The word is Egyptian, Hebrew, or Latin; it is an anagram; it holds the key to the mystery of the cards. Current Historical Understanding: The earliest names for the tarot are all Italian. Originally the cards were called carte da trionfi (cards of the triumphs). Around 1530 (about 100 years after the origin of the cards), the word tarocchi (singular tarocco) begins to be used to distinguish them from a new game of triumphs or trumps then being played with ordinary playing cards. The etymology of this new word is not known. The German form is tarock, the French form is tarot. Even if the etymology were known, it would probably not tell us much about the idea behind the cards, since it only came into use 100 years after they first appeared. Inaccurate: The symbolism of the trumps comes from Egypt (or India, or other exotic locale). Current Historical Understanding: The symbolism of the trumps is drawn from the culture of Medieval and Renaissance Europe. Most tarot subjects are distinctive to European Christendom. Illustrations virtually identical to each of the tarot subjects can be found in European art, and such precise analogs are not found in other cultures. Inaccurate: The gypsies brought the tarot to Europe and spread its use. Current Historical Understanding: This idea was popularized in the 19th century by several writers, notably Vaillant and Papus, without any basis in historical fact. There is no evidence that the Rom (gypsies) used tarot cards until the 20th century. Most of their fortune-telling was through palmistry and later through the use of ordinary playing cards. Inaccurate: The 52-card deck evolved from the tarot, leaving the Joker as the only remnant of the major arcana. Current Historical Understanding: Playing cards came to Europe from Islam, probably via Muslim Spain, about 50 years before the development of tarot. They appeared quite suddenly in many different European cities between 1375 and 1378. European playing cards were an adaptation of the Islamic Mamluk cards. These early cards had suits of cups, swords, coins, and polo sticks (seen by Europeans as staves), and courts consisting of a king and two male underlings. The tarot adds the Fool, the trumps, and a set of queens to this system. Some time before 1480, the French introduced cards with the now-familiar suits of hearts, clubs, spades, and diamonds. 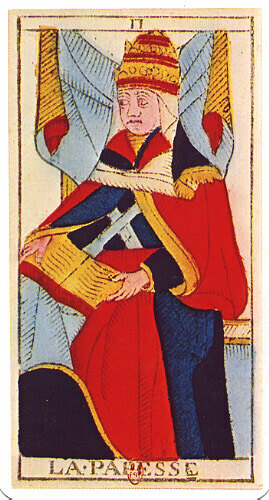 The earlier suits are still preserved in the tarot and in Italian and Spanish playing cards. The Joker originated in the United States around 1857, used as a wild card in poker and as the highest trump in Euchre. It appears to have no direct relationship to the Fool of the tarot. Inaccurate: The tarot was invented to amuse Charles VI of France in 1392, as evidenced by a deck by Gringonneur in the Bibliothèque Nationale in Paris [see illustration, left]. Current Historical Understanding: It is recorded that in 1392, Jacquemin Gringonneur was paid to paint three decks of cards for Charles VI. These were probably playing cards, not tarot. The deck in the Bibliothèque Nationale de France is a late-15th century hand-painted deck of the Northern Italian type (probably from Venice or Ferrara). 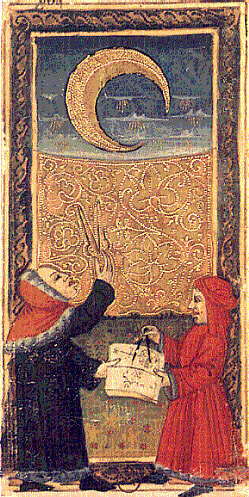 Illustration (above): The Moon from the Gringonneur or Charles VI deck from The Art of Tarot by Christina Olsen (copyright &COPY; 1995 Olsen and Abbeville Press). Click the image for a larger one. Inaccurate: Eliphas Lévi (c. 1850) was the first to ascribe Hebrew letters to the tarot. Current Historical Understanding: The Comte de Mellet, whose short article on the tarot was published in Court de Gébelins Le Monde Primitif (1781), was the first to write of a connection between the Hebrew letters and the cards. Court de Gébelin also mentioned the idea in passing in his own essay. Inaccurate: The Catholic and Protestant churches outlawed tarot and all who used it in an effort to stamp out either heretical teachings or a work of the Devil. Current Historical Understanding: The Inquisition documented in considerable detail what the church regarded as evidence of heresy and the tarot is never mentioned. Many printers made their living printing both religious cards and playing cards. Playing cards were sometimes restricted or outlawed because of their use in gambling. Tarot cards were, in fact, sometimes explicitly exempted from bans on playing cards, perhaps because of their association with the upper classes. In 1423, playing cards (tarot cards were not mentioned) were among many things thrown on the fires in Bologna by followers of Bernadino of Sienna during an attack against all studies and pastimes not focused on religion. After the Reformation, the church did object to the cards depicting the Pope and Papess, and cardmakers substituted less controversial images. Text copyright &COPY; 2001 Members of TarotL. Design copyright &COPY; 2001 James W. Revak. All rights reserved. Version 1.2 (9/14/01).